I definitely wrote this pattern for boys to begin with, but once I starting playing with color combinations, I soon realized they are pretty darn cute for girls as well. 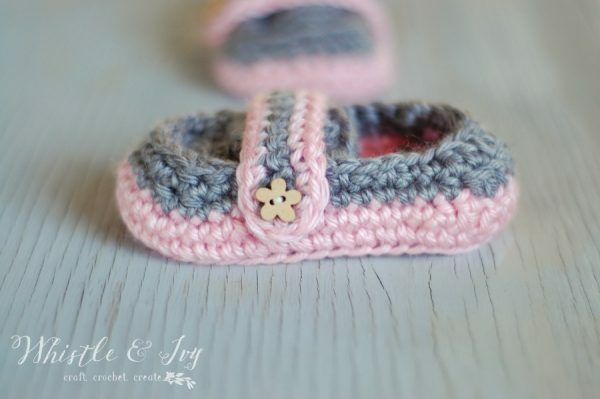 Change the colors and add a girly button, and they are sweet and feminine! These Monk Strap Booties are crocheted in the round, so they work up pretty quickly. Get the video tutorial for 3-6 Months HERE. 1. Work 3 sc in 2nd ch from hook. Sc in next 3 chs, hdc in next ch, dc in next 2 chs, 7 dc in last ch. Working across opposite side: Dc in next 2 chs, hdc in next ch, sc in next 3 chs. (22 sts) Place marker and move up each round. 5. Hdc. Dc 8. Hdc. Sc 28. (38 sts) Move up your stitch marker. Sl st and Tie off. 6. Join 2nd color at your stitch marker. Ch 1. Sc in same st. Hdc. Dc2tog. Dc 4. Dc2tog. Hdc. Sc 7. Sc2tog twice. Sc 6. Sc2tog twice. Sc 6. (32 sts) Join with a sl st.
3. – 6. Ch 1. Sc in same st. hdc 4. Sc . Turn. (6 sts) Leave a long tail. Strap: Start with 2nd color. 5. Hdc. Dc 8. Hdc. Sc 32. (42 sts) Move up your stitch marker. Sl st and Tie off. 6. Join your second color at your stitch marker. Ch 1. Sc in same st. Hdc. Dc2tog. Dc 4. Dc2tog. Hdc. Sc 9. Sc2tog twice. Sc 6. Sc2tog twice. Sc 8. (36 sts) Join with a sl st.
7. Ch 1.Sc in same st. Hdc2tog 4 times. Sc 9. Sc2tog. Sc 6. Sc2tog. Sc 8. (30 sts) Join with sl st.
8. Sl st in each st around. Tie off. 3. – 7. Ch 1. Sc in same st. hdc 4. Sc 1. Turn. (6 sts) Leave a long tail. 2. Turn the piece so that wrong side and is facing you, and join 1st color. where you left off. Ch 1. Sc in same st. Sc 11 across the strap. Work 3 sc in the loop at the end. Sc 12 across the other side. (27 sts) Tie off. 1.Work 3 sc in 2nd ch from hook, sc in next 4 chs, hdc in next ch, dc in next 4 chs, 7 dc in last ch. Working across opposite side: dc in next 4 ch, hdc in next ch, sc in next 4 ch . (28 sts) Place marker. 4. Work this round through back loops only. Sc in each st. (44 sts). 5. Hdc. Dc 8. Hdc. Sc 34. (44 sts) Move up your stitch marker. Sl st and Tie off. 6. Join color B at your stitch marker. Ch 1. Sc in same st. Hdc. Dc2tog. Dc 4. Dc2tog. Hdc. Sc 10. Sc2tog twice. Sc 6. Sc2tog twice. Sc 9. (38 sts) Join with a sl st.
3. – 7. Ch 1. Sc in same st. hdc 5. Sc 1. Turn. (7 sts) Leave a long tail. 1. Sc in 4th ch from hook. Sc 12 across the ch. Tie off. 2. Turn the piece so that wrong side and is facing you, and join 1st color. Ch 1. Sc in same st. Sc 12 across the strap. Work 3 sc in the loop at the end. Sc 13 across the other side. (29 sts) Tie off. 5. Hdc. Dc 8. Hdc. Sc 36. (46 sts) Move up your stitch marker. Sl st and Tie off. 6. Join your color B at your stitch marker. Ch 1. Sc in same st. Hdc. Dc2tog. Dc 4. Dc2tog. Hdc. Sc 11. Sc2tog twice. Sc 6. Sc2tog twice. Sc 10. (40 sts) Join with sl st.
7. Ch 1. Sc in same st. Dc2tog4 times. Sc 11. Sc2tog. Sc 6. Sc2tog. Sc 10. (34 sts) Join with sl st.
3. – 8. Ch 1. Sc in same st. hdc 5. Sc 1. Turn. (7 sts) Leave a long tail. To attach the flap, lay in on the shoe so it sits on top of the edge of the toe. Using a yarn needle and your long tail, attach it by sewing in and out of the slip stitches around the edge, and catching the corresponding piece of yarn on the toe flap. To attach the strap, an easy method is to take the four tails at the end of the strap and using your hook, fish them through the bottom side of the shoe. Attach them at the 2nd row of your second color. Make sure your tails are fished through along the same row, so it sits even. Then, reach inside the shoe and tie the tails together with a knot. 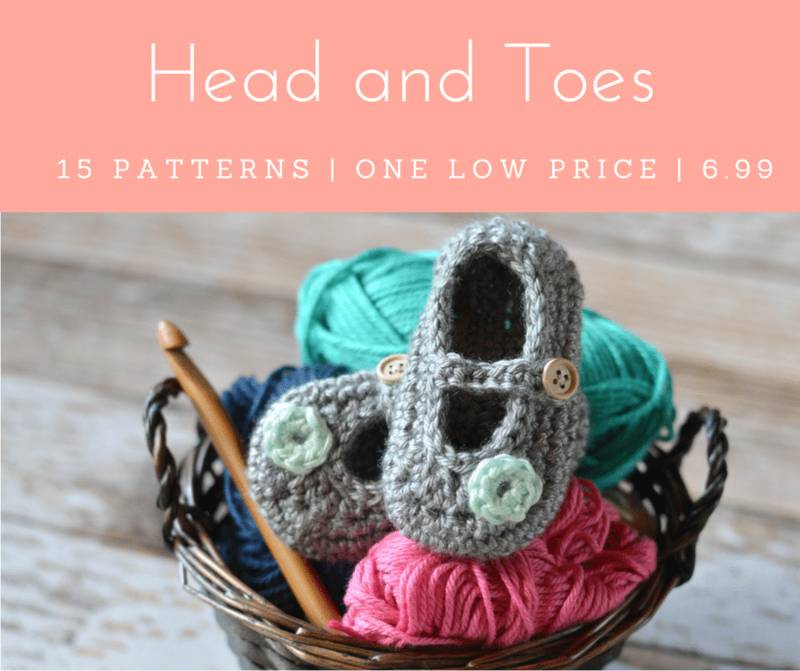 Don’t miss a pattern or project! Subscribe to Whistle and Ivy. You can find me on Facebook and Instagram, too! Show off your projects and make some crochet friends in the Whistle and Ivy Facebook Group. Wondering about a toddler pattern for this. I just made a 9-12m and tried it in my 11mo and it’s not gonna work. :-( I was planning on just adjusting the boat shoe pattern to eliminate the tabs, so even just suggestion for the starting chain length for the strap for a size 5 would be super helpful. Thanks! 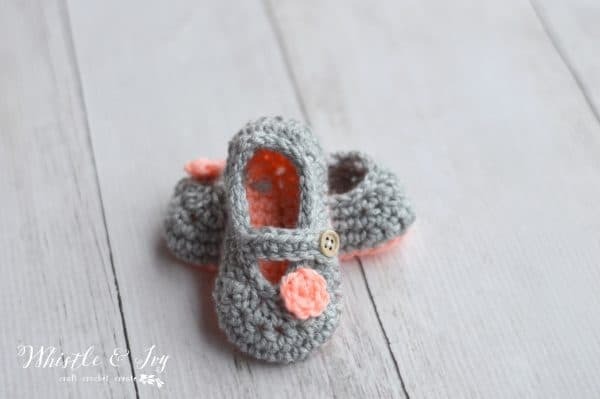 I don’t have a toddler pattern for this shoe I am sorry! 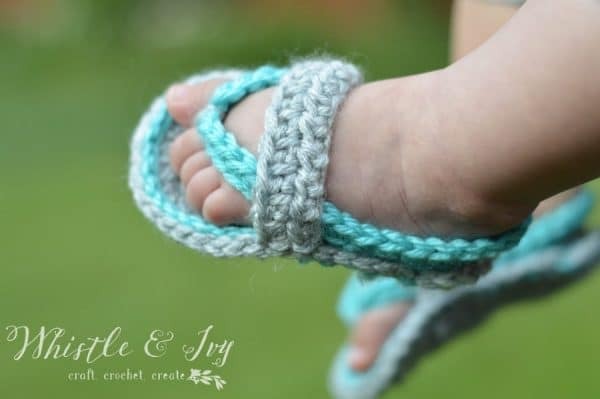 The easiest thing to do would probably be to use a larger hook and a slightly thicker yarn and work the 9-12 month pattern. Hello, what a precious pattern! I made a couple pairs of the 0-3 month and I love them! I have a question though. I strughle on all of them when adding the second color. Especially around the heel area, the stitches curve in on the decease. I notice in the video that your shoe stays vertical instead of curving inwards. I’ve tried loosening my stitches, but then the stitches seem too loose and I still am curving inwards. Do you have any advice? Thank you so much!! Maybe the video doesn’t show very well, but the heel is supposed to turn inward! The decreases keep the heel on the baby. I noticed this problem with my very first shoe design several years ago. I had the heel going perfectly vertical, and my niece kicked them off in 1 second flat. Even though they can still be kicked off, curving the heel helps keep the shoes on the baby a bit better. You are doing great! That’s good to hear! Now I notice in your pictures that the orange and pink pairs are curved as well. Thank you! I had the same issue. I went back and on 2nd round of the 2nd color, I reduced the 4 dc2tog to 2 dc, 2 dc2tog, 2 dc. And still, the heel curves in so much that I don’t think you would even be able to get shoe on a baby. Not wanting to take apart and redo a 3rd time. You are welcome to reduce the heel curve, but these were tested on real babies! The cupped heel makes them stay on baby’s feet. I am afraid if you reduce it, the will come off extremely easily. 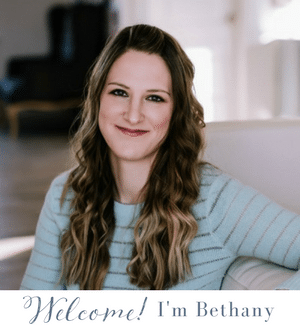 Bethany, thank you for such wonderful patterns! I do have a quick question. I have a client who wants a pair in only one color yarn. I would like to continue from round 5 to round 6 without tiring off and rejoining. Wondering if you had a suggestion. If I need to tie off and rejoin I will. Thanks for your help! Well it gets a bit tricky because when you join the new color, you change from continuous rows to joined row. The easiest way might be to work the sole in joined rows, so instead of continuing around, you should join with a sl st (with the beginning stitch) and ch 1 at the beginning of the sole rounds. Does that make sense? Question! I am at the point to do the toe FLP, is it attached to the shoe or is it added after? It’s a separate piece sewn on after. What does this mean? I can’t figure out the asterisks. The asterisk is separating the instructions that need to be repeated. So you will repeat the entire instructions between then 3 times for the toe and 5 times for the heel. Thank you very much!! So glad you like them. Thanks for hosting! do you have this pattern for toddlers? Thank you so much! I don’t have this one in a toddler currently, but I can certainly put it on my request list! Thanks for your patience! I am sorry you are having trouble! Have you double-checked your join? It might be in the wrong place. I played with the 0-3 size pattern, and I found that it should be 36 sc into the back loops not 38. I am also having the same problem. 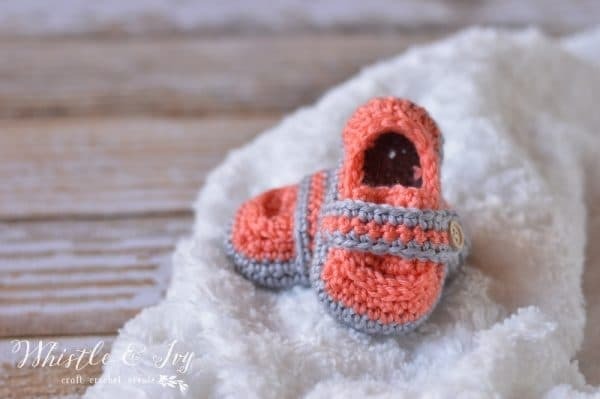 I’m not new to crochet either, and this isnt my first booties pattern. The DCs have to be off. There’s really no other explanation for it. But that will also mean some of the other stitches are off. I’m going to play around with it and I’ll let you know. Which size and which step? Did you join in the correct place? Thanks for letting me know! I will go in and edit it. Hi! I am so excited to try out these loafers! I purchased a pattern very similar to this and after many tries got stuck on the same part with it looking strange and never finished. I was really sad because I wanted to have them done by the time my nephew arrived. He is 3 months now so I’m going to give your pattern a try. Thank you so much for the pattern and video tutorial!! The visual will help me out tremendously! The pattern is printable. You don’t need to download, you can just click the link and view it. Once again, an awesome baby shoe pattern! Big Thanks for sharing!!! These are soooooo adorable. I can’t wait to try it. Thank you! First I want to say that I LOVE your patterns! They are so easy to understand and then the fact that you add the video as well makes it even easier! Ive made most of the baby shoe patterns you have on here! With this one, I just have a little suggestion! The pattern for the tongue of the shoe was extremely hard to follow and it came out pretty triangular in pattern! At the end, I ended up SC around the edge of the whole thing and DC in the areas I needed to fill in more (the “top” of the triangle) like you have written for the lip of the boat shoes! Other than that it was an awesome pattern! I am a military family and a lot of my friends have and are having babies so making these for them is always a treat! Thanks! Really? I am trying to understand how you got triangle out of it. The bottom is curved so it fits inside the toe area, is that what you mean? Maybe you were attaching it upside down? Would you like to send me a photo so I can see what is going on? I already finished the shoes but when I do another pair I will definitely show you! I guess it makes more sense that it was curved to fit the shoe. By triangle I meant that the first few rows were not as wide as the rows after it haha sorry for the confusion! I probably was just expecting it to be like the toe flap of the boat shoe and got confused when it wasnt! Either way, they came out adorable! Well, I am glad they worked for you! An having trouble now that I am ready to attach the flap to the shoe. I can’t tell which is the toe and which is the heel. I’m worried I did it wrong. The wider end is the toe. I am so sorry! I completely missed that on the 0-3 size. You should be working in joined rows, so yes you need to join. Sorry for the confusion, I have updated the pdf. I am a novice at crocheting, but I am hoping you can help me with your pattern. When I do round two of the sole I don’t reach my marker from where I started. Is that supposed to happen? I am doing the 0-3 month size, I am left with 3 stitches till my marker if that makes sense. I am not sure what I am doing wrong. No, you are supposed to reach the marker. I have a video on the sole, you can find here. If that doesn’t clear it up, come back and I can try to help further! Hi I love this pattern! I’m going to be traveling and I tried downloading this on my kindle for easier review and the watermark is black so I’m unable to read the pattern… is there something else I can do differently? Have you heard of others having this problem? Yes! Use a different reading app than the default one. For some reason, the light gray watermark shows up black on that one. I have spent the last 45 mind trying to get the written pattern for the 12 month size and keep getting redirected to the same video and link for the 3 to 6 month…..plz help! I’m sorry you are having trouble! The pattern link appears to be working, though. 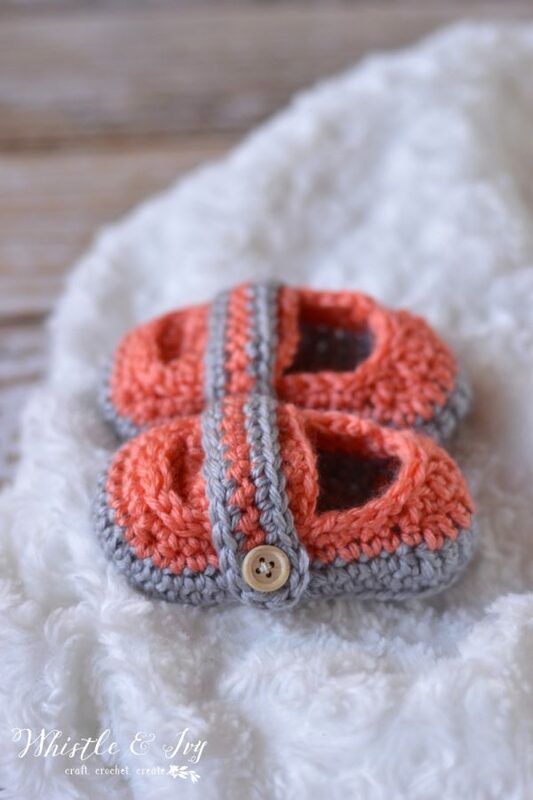 The pattern link says “Monk Strap Baby Booties”, the video link says “HERE.” They are two different links. Click the link for the pattern pdf. I sent you a message on FB, but in case you didn’t get it, I will reiterate here! I don’t have just a written pattern for the sole, it’s the same for all my bootie patterns, the first 3 steps. Also, I don’t have a newborn size, the smallest size 0-3 months. I have a predicament. All I have is a 5.5 mm crochet hook. How would I adjust the pattern so that they aren’t too big? Hi! I love these loafers! I downloaded the pattern but unfortunately I can read it because there is a big stamp over all of the directions :( any suggestions? Thank you Nikki! Are you trying to read on a reading device or tablet? I have had some readers comment that their devices don’t display the watermark correctly (it is very light gray and doesn’t interfere with the pattern). But most have had success using a different reading app, or a different browser. Give a try! Ah! I am on my phone so that is probably why! I will have to figure out a way. Thank you! For step 8: sl st all around – is that in both loops or just back loops? I made a pair of these and they look amazing!! I made them white and blue, But I also want to make more with some of the colors you used so can you tell am some of the colors you used?? Hi! :) do you have a youtube page where you could show how to make these, or would you be able to do that? 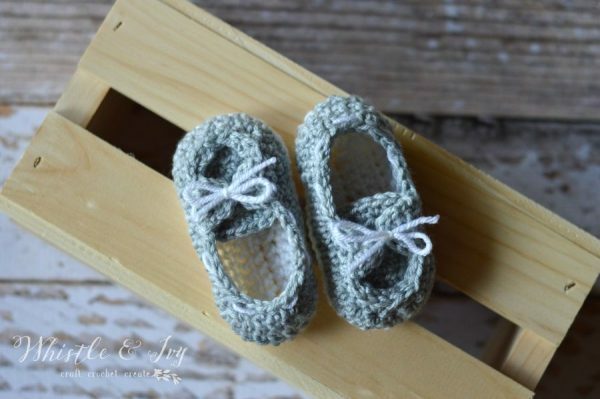 I’m new to crochet but can them on there pretty well… just a thought, thank you! Yes! I plan on getting videos for all my patterns. It just takes quite a bit of time, sadly. Do you sell the Monk strap booties? I went to your Etsy site and didn’t see them listed. I have a grandson due in September and would love to buy some of these! I can! I activated the listing for you if you are still interested. I love your pattern, but I’m working on the 3-6 month pattern and I’m a little stuck on the toe flap. The pattern says “(Turn. Ch 1. Sc in same st. hdc 5. Sc 1.) Repeat 3 times leave a long tail.” If I’m reading this correctly, I chain 1 to turn, then single crochet in the first stitch, 5 half-double crochets in the 2nd stitch, then single crochet in the 3rd stitch and repeat this 3 times. That would require 9 stitches, though and there are only 7 stitches in the 2nd row. Am I interpreting it incorrectly? The hdc are each in their own st. You will be turning after each time, making a square-ish shape. So you will ch 1, sc 1 in same st, hdc 5 (each in own st) sc 1 in the last st and turn. Then you will repeat the row three times, turning at the end each time. Oh, thank you! That makes so much more sense. I really appreciate your help. Thank you so much! I am so glad you like them! These are so cute! I just printed out your Baby Boat Booties and did see the gauge, thank you. Id the gauge for these the same? Do you recommend using a slightly larger hook if your need to make them 5″? My 6 month old grand son has 4 1/4″ feet now. Your work is beautiful and thank you for making the patterns available to us. Hi! How can I find the pattern for the 12 to 18 months because all the links I open send me to the file that end with de 9 to 12 months. I have recently rewrote this pattern and ended up omitting the 12-18, it was just too long and didn’t quite work. It needs to be a separate toddler pattern, not a baby pattern. I will have a toddler pattern coming soon! hi. love the pattern. but do you know that every time i am on this page i get a spam notice that says “java needs updating” Its not from Java…..My anti virus program catches it everytime. just thought you’d want to know. And then, of course, I tried it one more time and it worked! oh my goodness… Thank you for the pattern!!! You’re welcome, glad you got it! Please please please post a video of how to make these. 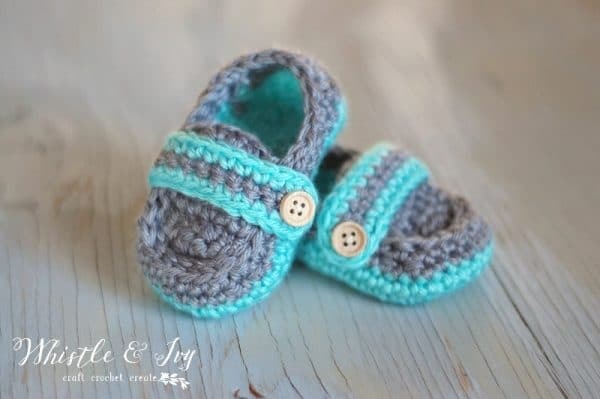 I’m a visual person and would love to make these for my friends and family that are expecting. Thank you! Videos are actually difficult and time consuming to create :( I will try to help as much as I can if you want to try to make this pattern by reading it; it’s really quite simple! I made the sole but am having trouble with color B. Adding it onto the sole (because It looks funny to me when I add color B) and as I am crocheting around, I keep ending up doing the toe strap at the bottom where the heel is (if that makes sense). That section is a little confusing to me. If you can help me I would REALLY appreciate it!! Which specific step and size are you working on? To attach your color, you should make a slip knot and use your hook to slip the loop through the same stitch as your stitch marker. Since I am having you sl st and tie off, you won’t be starting your new color in the last st, rather where you marker is. Because this pattern is worked in the round, it won’t look completely perfect. If you look closely at the photo of the green shoe heel, you can see where I started the new color isn’t exactly “in line”, but it’s subtle enough to get away with it. The heel piece and the toe strap are separate pieces that you attach with your yarn needle when you are done making the shoe. Thanks so much, Winnie :) Thanks for the visit, too! So cute!!! I really like the green booties! Thanks for sharing at Submarine Sunday! Thanks for linking up to Super Sunday at Who Needs a Cape! Can’t wait to see what you bring us next week! Those are SUPER cute!! WIsh my toddler’s feet were still small enough to wear, I would give it a try for sure! Thanks for sharing at the DIY Sunday Showcase! Thanks so much, Jennifer! My kid’s feet are too small too, but he probably wouldn’t wear them anyway! That’s what’s nice about babies, they just wear what you put on them, lol! Yes, these are adorable. Thanks for the share. I think I will make some for a charity at church that makes and provides new clothes for kids that don’t usually get new ones. Thank you so much for sharing your adorable pattern! I can’t wait to make these for baby shower gifts. I’m also going to share your site with a friend who would love this pattern. I’m a new follower and am excited to browse through your site. Thanks so much, Doxie! I love sharing my patterns, and I hope you get good use out of them :) Thanks for following, have an awesome day! !